Organizations are becoming flatter. Companies that once had deep hierarchies are flattening their corporate management. Categories: Leadership, Product Management, Trust | Tags: facts, influence, leading up, process, success | Permalink. Feedback: The word feedback is a technical term meaning “a mechanism, process or signal that is looped back to control a system within itself.” The term has evolved in business language to mean receiving information from others — either verbally or through written means — about topics important to you. The key to benefitting from feedback is listening. If you want to improve, seek out feedback from others, listen to what they say and take action. Breakfast: Some say that breakfast is the most important meal of the day; I agree. It’s the fuel that gets you going in the morning. It’s the energy that drives you throughout the day. You receive power from eating. Champions: Usually associated with sports, the word champions identifies the ultimate winners. These are the people who have worked smart and hard to achieve a goal. They work together. They achieve what others do not. They may not be the most naturally talented at what they do, but they work harder and have more of a team mindset than those with whom they compete. They are the leaders. So, after going through this exercise I’ve come up with the following Lead on Purpose adaptation to “feedback is the breakfast of champions”: Listening is the power of leaders. But it’s not only listening, it’s acting on what you hear. It’s making an effort to know what others are thinking. It’s working hard to improve based on others’ experiences. It’s knowing when to say “yes” and when to say “no.” Ultimately, it’s knowing that you or I do not have all the answers, but together we can know what is best. The Product Management Perspective: Recently I’ve received some great feedback from co-workers and customers. Through this process I’ve realized how important it is to listen and make decisions based on what you hear. I’ve always known this but at times have been blinded by own knowledge and experience. It’s a positive thing to receive feedback that — though painful at the time — gives you a new perspective on where your products are headed. To succeed as a product manager you need to hear what other have to say, apply the positive aspects, swallow your pride and move forward. Categories: Leadership | Tags: champions, feedback, Leadership, listening, process, success | Permalink. “If it is true ‘a life’s mechanical functioning is a result of the systems that compose it,’ then getting what one wants in life lies in continuously improving those systems.” This is the heart of the book WORK THE SYSTEM: The Simple Mechanics of Working Less and Making More. Early in his career the author, Sam Carpenter, worked 100+ hour weeks at his telephone answering service company, was struggling to support his family (in multiple ways) and was on a potentially devastating downward spiral. At one point he and his two teenage sons lived in his work office because they could not afford another place to live. Then he reached a point where he did not know how he was going to make payroll and keep his business going. He lay awake one night, nearly at the end of his rope, and two simple questions came to him: “What have I been doing wrong all these years?” and “Since the end is coming, what is there to lose if I abandon past assumptions and look at things from a completely different angle?” This is when it struck him that his company (Centratel) was nothing more than an assemblage of sequential systems. Through this experience Carpenter developed a set of processes and methods that drastically reduced the amount of time required at work and significantly increased his income. Strategic Objective: A one-page document that provides overall direction for your business and your personal life. “Caution: this is not a job for a committee. It’s a job for you, the leader.” This document gives direction and reduces churn, both individually and within an organization. Working Procedures: A longer document; a specific collection of protocols that outline how the systems of your business or your job will operate. Carpenter cites the specific example of their check deposit process as one procedure. With this working procedure, Centratel drastically reduced the time it takes to process payments. The book contains a well-though-out combination of quotes, perceptive side notes and end-of-chapter stories that weave the principles into clear, actionable steps. Carpenter drives home a philosophy he call “outside-and-slightly-elevated,” taking a step back and looking at looking at a problem (or opportunity) from a different perspective. This perspective helps you understand how to apply the principles to your own situation. The book’s third section covers varied topics such as not becoming too pedantic, exercising quiet courage, increasing consistency and using the “prime time” of your day effectively. It is a complex book; not an easy read. You will need to spend more time reading and thinking on this one than the average business book. Some parts will challenge you to keep going. However, it is well worth the read overall. The time invested in improving (or working) your systems has the potential to change your life significantly. My favorite quotes from the book: “Procrastination–the lack of quiet courage–will ruin your life if you let it” p191. The Product Management Perspective: Product managers face an interesting challenge: they are (usually) responsible for the success of their products, yet the people they rely on to get their products successfully out the door do not (usually) report to them. This situation lends itself to planning and preparation. It probably does not make sense for the product manager to write the documents described here for his/her team. However, the principle herein will help every product manager improve his/her effectiveness. Categories: Knowledge, Leadership, Learning, Purpose | Tags: methods, perspective, principles, process, Sam Carpenter, systems, Work the System | Permalink. Companies and individuals often go to extremes in their search for success. They look for the most sophisticated processes hoping they will get a leg up on their competitors. In all their efforts to make their organizations more complex — thinking that will make them more successful — they forget the fundamentals. One of the fundamentals missed by many organizations is people management. Art continues: “Fewer organizations than you might think are doing anything to engender employee satisfaction…which is ironic given the mountains of data that indicate that employee satisfaction flows through to customer satisfaction and strong financial performance.” The people in all parts of the organization need to be “on board” and believe in the purpose of the organization. That’s just one of the fundamentals of leadership. The Product Management Perspective: Product managers must focus on the fundamentals: market inputs, problem statements, features, requirements, etc. As they focus on getting these things in order, product managers will gain the trust of their teams. When the teams know they are working on the right things for the right reason, they will do amazing things. Categories: Leadership, Product Management, Team Building | Tags: features, fundamentals, market inputs, problem statements, process, requirements, success | Permalink. How do successful leaders identify market needs and create innovative products and services to meet those needs? They start with ideas. Ideas potentially come from many sources and need to be nurtured effectively to succeed. Idea generation: Innovation starts with good ideas. Ideas generally come from three areas: internally (within the team), cross-functionally (from different teams within the organization), and/or externally (from customers, partners or other sources external to the organization). 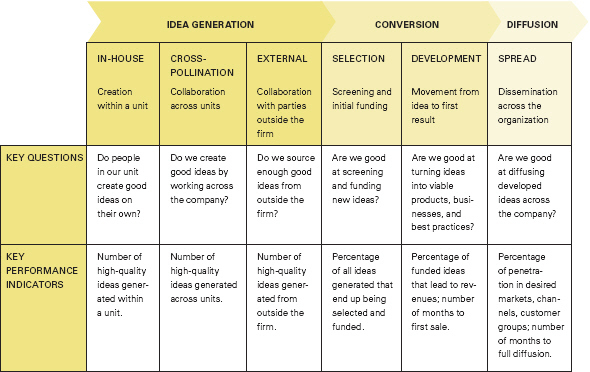 Idea conversion: It’s one thing to generate ideas, but if they are not converted into products (or features or services) they will not benefit the organization. Idea diffusion: Once ideas have been examined and developed, they still need to receive buy-in (both from within and without the organization). Subsequent posts will focus on each phase in more detail, what happens when one or more of the phases is neglected, and how organizations can fix problems in any stage. The Product Management Perspective: Product managers play a key role in gathering ideas, converting them into products and distributing them to their markets. The more they focus on proven processes to guide them, the more predictable will be their success. It’s critical that product managers not only understand the theory behind innovation but also understand how to implement it. Categories: Leadership, Market-driven, Product Management | Tags: Harvard Business Review, ideas, Innovation, market needs, process | Permalink. Step 1: Find Unresolved Problems. How do we know what market and product to focus on? Step 2: Understand Buyer Personas. How do we identify who will buy our offering? Step 3: Quantify the Impact. How do we know if we have a potential winner? Step 4: Create Breakthrough Experiences. How do we build a competitive advantage? Step 5: Articulate Powerful Ideas. How do we establish memorable concepts that speak to the problems buyers have? Step 6: Establish Authentic Connections. How do we tell our buyers that we’ve solved their problems so they buy from us? The book details how companies such as Starbucks, Zipcar and Disneyland got tuned in to their markets; how organizations such as NASCAR and Picture Perfect Weddings understand their customers; why products such as the Blackberry and GoPro camera meet specific needs of buyers; and how a magician, a preacher and a doctor all tuned in to specific needs of customers in their niche. Finding the resonator is key to the success of the company, and tuned in entrepreneurs and executives find ways to make their products and services stand out. They create opportunities for their ideas to take off and become successful. They understand their market and products. Telling: Try to create the need by expensive advertising or an army of salespeople. Craig Stull is the founder and CEO of Pragmatic Marketing, Inc. and the author of the industry-standard Pragmatic Marketing Framework. Phil Myers is President of Pragmatic Marketing, and a frequent writer, speaker and consultant on the subject of Tuned In Leadership Strategies. Check out Phil’s takeaways from their book tour. (Side note: I met with Phil for lunch a few months back and he kindly gave me an advanced copy of the book). We will no-doubt be hearing great things about Tuned In for years to come. I highly recommend it to your reading! Categories: Knowledge, Learning, Market-driven | Tags: authentic connections, buyer, ideas, persona, process, resonator, tuned in | Permalink.